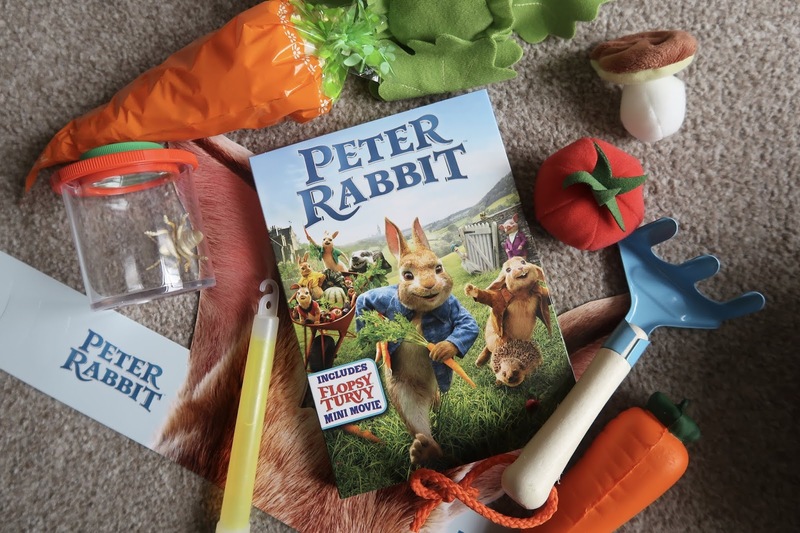 Peter Rabbit is a character that brings fond memories from my childhood. From reading the books with my mum and loving the adventures that he went on, to reading it to myself under the bed covers with a torch to keep the love of literature alive. It's the first series of books I remember being obsessed with and I love the fact that since reading them to Max, he's also fallen in love with them too. He tends to read one a night (at least) and loves the way that Peter and his siblings are mischievous and give him ideas for playing tricks on people! So when we heard that this family favourite was going to be a film, we couldn't wait to see it. Unfortunately it left the cinema before we could watch it, but the lovely folk over at Sony Pictures and Cine Mini sent us a lovely package to celebrate the DVD release. 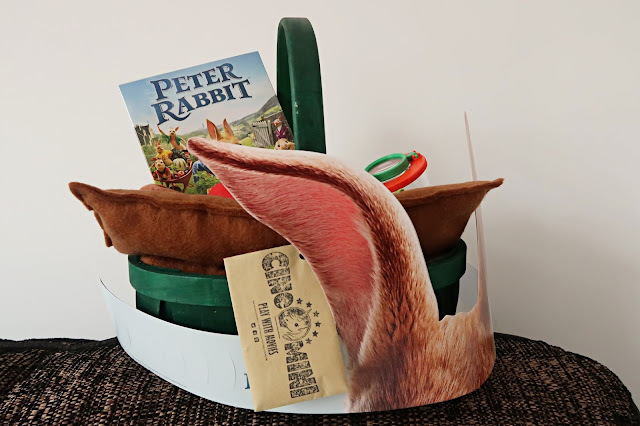 Upon opening the box I was so surprised to see a gorgeous basket of treats for us to enjoy throughout the film. 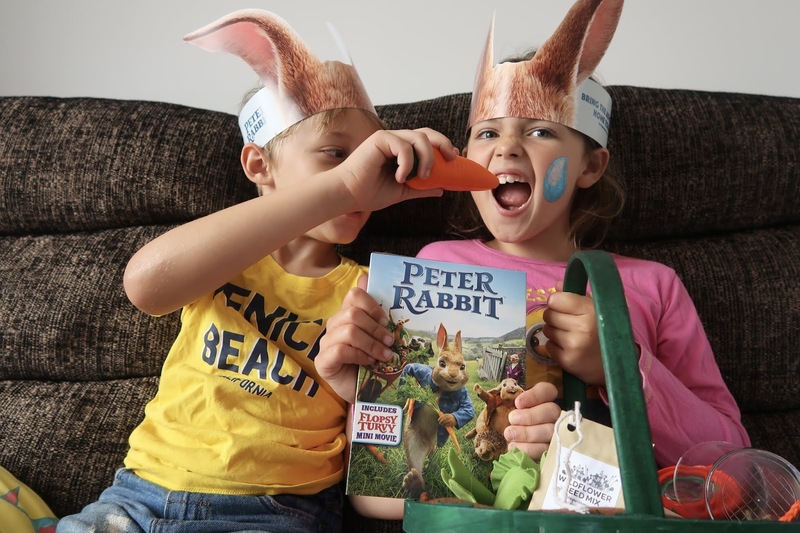 Along with the DVD (which was released on the 23rd July), we were given some adorable Peter Rabbit ears that the kids put on straight away! There was also some carrot shaped popcorn to munch on, a glow stick, some gardening tools and wild flower seeds, some squishy veggies, a bug hunting kit and to top it all off, some felt veggies in their own veggie patch! Max and I popped over to his best friends house to sit and watch the DVD as we knew that she was excited to see it too for an afternoon movie. We couldn't wait to see what the films was all about and I think us adults were just as excited as the children! The film tells the story of Peter Rabbit and his friends and family and their rivalry with their neighbour Mr McGregor. After the old McGregor dies, the animals are left to enjoy all the veggies and are able to roam free in the McGregor estate. That is until his long lost nephew inherits the estate and takes a dislike to the rabbits as much as his predecessor did. With some sneaky stunts and tricks, he sets about trying to trap the rabbits and put them out of their misery. That is until he meets his lovely neighbour Bea who is quite fond of the rabbits and has become an ally to them. With gorgeous drawings that tell stories of the rabbits (I think you've worked out who she is based on! ), she wants to make sure they are safe, yet can she save them when she's falling for the man that hates them? We absolutely loved this film. There's a perfect blend of comedy, slapstick humour, great music and intense moments. My favourite characters have to be Mrs Tiggy Winkle and Pigling Bland, I mean who doesn't love a peanut butter loving hedgehog and a pig that loves celery! The kids loved the pranks that Mr McGregor and Peter played between them and roared with laughter at the mess and destruction that was caused. All in all, it's a film that perfect for young families. With the right amount of serious story tied in with humour, you can easily get transported to this quintessentially British countryside tale. Whilst the storyline wasn't the most deep or developed, that didn't matter as the characterisations of these much loved characters made you fall in love with Peter Rabbit all over again!